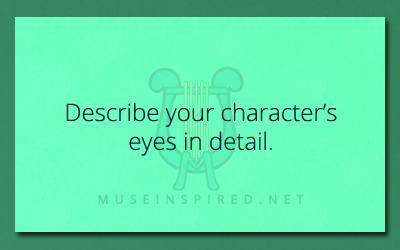 Eyes - Describe them in detail for your character. Character Development – Describe their eyes in detail. Eyes – Everyone has them, describe them in detail for your character. The eyes are the window to the soul. We hear this all the time. For this exercise, describe them in as much detail as possible. Here are some things to consider! Almond, round, squinty, upturned, hooded, monolid, downturned, etc. Fonfabulous has a GREAT shape guide. Wide set, close set, deep set, tilted, parallel, and so on. They may be really close together, or far apart. Consider that everyone has a perfectly symmetrical face, perhaps this is a unique character trait. Blue, green, hazel, brown, gold with flecks, or even unrealistic shades. Playing with color and descriptive details is a fun way to add a little flair. Are their hazel orbs more green with a little ring of brown, or do they have ocean blue pools? What sort of emotion would some see if they stared in to those eyes? With just the right words, you can convey all kinds of things. The sadness hidden beneath a sunny gaze, or the cold dead emotionless stare of a serial killer. There’s a whole world of possibilities here. Makeup is a wide and varied art form in many cultures. This Tumblr search can give you loads of inspiration. Tattoos? Shape and thickness of the brows? Long lashes, normal, or heaven forbid – none at all! Maybe they are missing one or both. Perhaps they are made of glass. Laser beams could shoot out every time they take off their sunglasses. For added fun you can see what shape might mean for personality with this cool link. Obsidian Bookshelf also has a really great guide for describing them in your writing. Now Novel contains excellent advice on the subject, while Words to Use provides you with a big list of descriptive words! Character Development - How well can your character walk in heels?